Renewable power has been hit hard, but now could be a good time to look at this trio if you are a long-term investor. First Solar Inc. (NASDAQ:FSLR), Pattern Energy Group Inc. (NASDAQ:PEGI), and Brookfield Renewable Partners LP (NYSE: BEP) have each been dealing with the headwinds of a difficult renewable power market, but there are solid signs that the three stocks are positioned to benefit in the future. 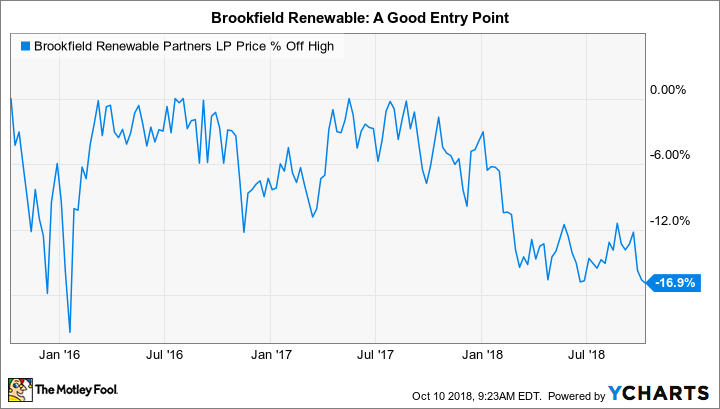 If you can handle a little near-term uncertainty, these three Motley Fool contributors think you should get to know these renewable power stocks today. John Bromels (First Solar Inc.): Even if you'd given up on solar stocks after their dismal performance in 2017, you should keep an eye on domestic solar panel manufacturer First Solar in October for three big reasons. Second, the current tariffs of up to 30% against imported solar panels don't look to be going away anytime soon, making domestic manufacturers like First Solar more attractive to customers. And, of course, state governments often prefer to support domestic manufacturing when spending on large infrastructure projects, rather than risk being accused of supporting foreign competition.